I've been working on a visual of my Lean Implementation Plan, this methodology is used as part of my training sessions at various companies around the U.S. I have discussed different segments of this throughout my previous blogs. As you can see "problem solving" is the core of implementing change within a company and their ability to implement a Lean culture. Most companies tend to jump to the "how" start with the TPS tools which usually only show short-term gains. This is because the "purpose"...(Why we are doing this?) Isn't understood totally. Once a company's employees understand WHY then we move on to the WHAT and that is engaging, involving, and challenging them to "think" or problem solve. Only then can the tools be taught and fully understood as the "whole management system". Once this new way of thinking (culture development) begins it must be visualized and posted for all to see. This can quickly show team members their current situation vs. where they need to be in regard to the standard or --companies expectations (key performance indicators). We call this Workplace Management Development System (WMDS) and it brings together the goals of the company with the ability to develop team members in the systems/tools to reach those goals. All these processes lead a company to eliminating waste, and profits by cost control. It looks simple, its just not easy!!! 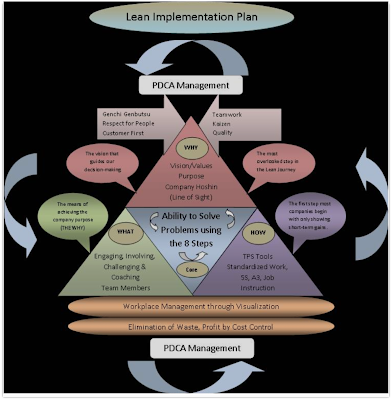 You implement all these processes while managing them by the PDCA (Plan-Do-Check-Act)...these systems=success in a company guaranteed!!!! Very nice visual, Tracey! I will have to print it out and digest it a little. But I appreciate your effort and understanding of Lean to develop it! Tracey, your lean implementation plan is solid! Thankyou for your efforts to make this visual. Can you please guide me on Daily Work Management. How and when to implement? Hi Tracey, I like reading your articles on Lean.org. I have become an addict of TPS and practicing in my company/Gemba. can you also email be a bigger version of lean implementation plan and if i can have your permission to share with my lean team.